Co-presented by the Asian Arts Initiative and The Laundromat Project, artists Michael Premo and Rachel Falcone of Housing is a Human Right created The Office of Human Rights. 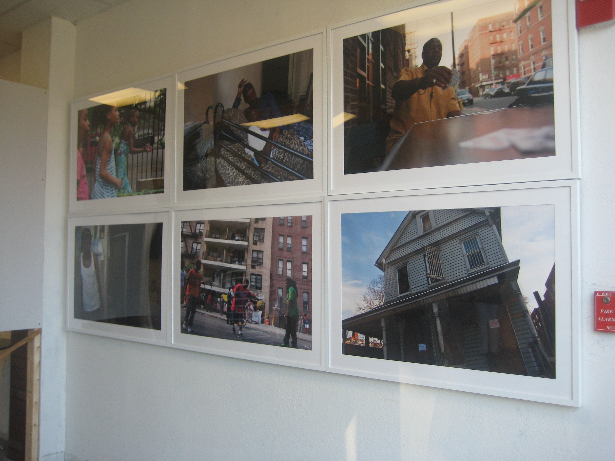 The exhibit featured over 50 photographs exploring the struggle for Home, stories-in-sound, and live remixing of your stories by DJ SpazeCraft One. Past events included a town hall meeting, film screening, storytelling workshops and oral history training, and oral history interviews with local residents of the North Chinatown and Callowhill neighborhoods. The exhibition brought awareness to the struggle of community members to obtain and maintain a place called “home,” and to build a collective definition of what home means to the people of Philadelphia’s Chinatown, and beyond. Michael Premo is a multidisciplinary artist, theater producer, and arts consultant, who has worked with the Hip-Hop Theater Festival, EarSay, Inc, StoryCorps and The Civilians, among many others. He was a founding producer and curator of The Globesity Festival: Hunger Strike Theater. Michael studied the role of arts in social and political organizing at the University of Cape Town in South Africa. Rachel Falcone is a creative producer who has worked on such interview-based projects as EarSay Inc., None On Record and the award-winning national history project StoryCorps. Her independent radio documentaries and multimedia have been broadcast internationally, and shared through interactive installations in partnership with The Laundromat Project, MoCADA, SUPERFRONT Gallery, Adriala Gallery, Chashama Studios, New Museum, MAPP International Productions, Asian Arts Initiative, Occupy the Empty Space, and NPN/VAN. She has presented her art and organizing work at numerous festivals, educational institutions and other venues across the country, and she teaches oral history and storytelling for movement building in collaboration with institutions like the Museum of the City of New York, People’s Production House, the Institute for Social Ecology and others. She studied Philosophy at University College London and Vassar College. They co-created and collaborated on the multimedia storytelling project Housing is a Human Right, a project connecting diverse communities around housing, land, and the dignity of a place to call home.